Mitt Romney, left, the 2012 Republican presidential candidate, with his running mate, Rep. Paul Ryan, after a speech to the 2012 Republican National Convention in Tampa, Florida. The Republican National Committee on Tuesday picked Cleveland to host the 2016 GOP convention. Some might be thinking that this is a suave move for the Republican Party. Ohio is one of the most important swing states, and no Republican has ever won the presidency without it. By holding their convention in Ohio, Republicans may be trying to tip the state in their direction. Here’s the problem: There is no proof that a convention site has much effect on a state’s voting patterns. Let’s take a look at the data over the past 50 years. There have been 26 conventions, 23 of which were not repeats (i.e. a party holding a convention in the same state twice in a row) or held in the same city as the other party. If there were a large convention effect, we’d expect to see a party’s candidate improve relative to his national performance as compared with the same party’s candidate four years ago. For example, the GOP convention in 2012 was held in Tampa, so Mitt Romney should have done better in Florida than John McCain did in 2008, once we control for the fact that he did better nationwide. Yet we don’t see a clear effect. On average, candidates have done only 0.4 percentage points better than we’d expect given the swing in the national margin. That could be just noise; it could be a very small effect. Fourteen candidates did better in the state of the convention than we’d have expected, but nine candidates did worse. If we look at just the Republican side, the candidates have done 0.7 percentage points worse compared to their national swing on average. Six candidates did better, and six candidates lost ground. This included Romney, who gained on McCain’s 2008 margin in Florida, but by fewer points than he gained nationally. 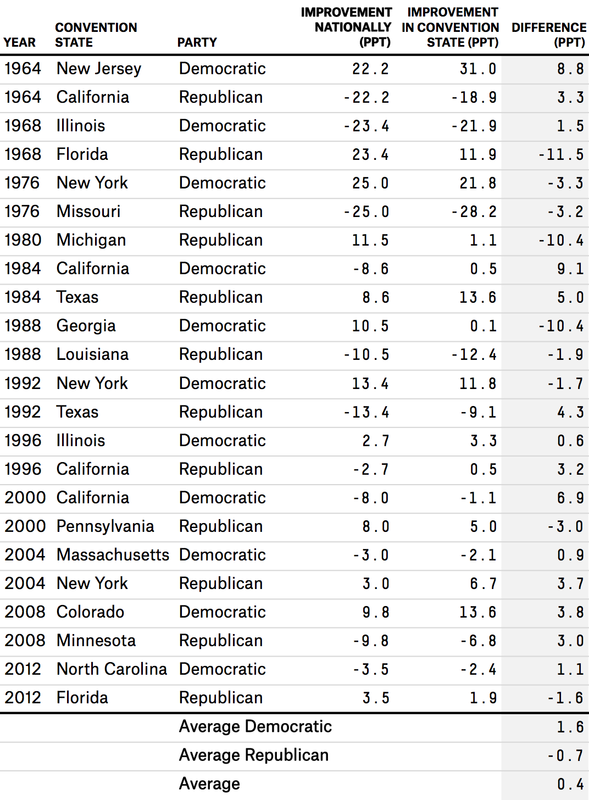 There’s a somewhat stronger argument that Democrats have done better in the states where they held their convention. They did 1.6 percentage points better in their convention states, on average, than they did nationally. In a close election, that’s enough to make a difference. But again, that’s a small enough difference that a large portion of it could be attributable to randomness. Now, there are obviously other confounding variables, including home state advantages, the actual content of the conventions (was there a major flub?) and money spent on advertising. Also, correlation does not equal causation. Still, the mere fact that the Republicans chose Cleveland probably doesn’t say very much about how the Buckeye State is going vote in 2016.